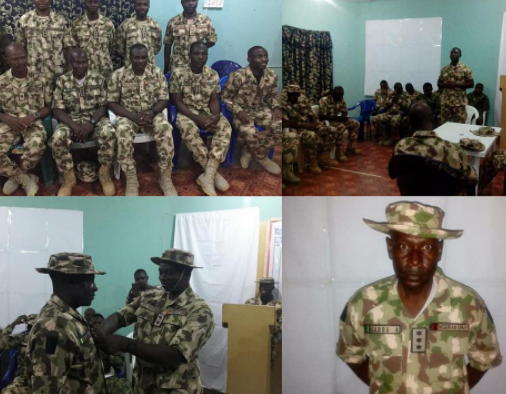 Bravery and selfless service: Nigeria Army council gives accelerated promotion to Master Warrant Officer to rank of Captain – Royal Times of Nigeria. The council of the Nigerian Army has approved the accelerated promotion and commissioning of Garba Abdullahi from the rank of Master Warrant Officer to the rank of Captain. Garba was considered worthy of this promotion for his gallantry and bravery and selfless service to the Nigerian Military. The Military, on Monday 16th of October approved the granting of the Executive Commission to 79NA/21553 Master Warrant Officer Garba Abdullahi of the 159 Battalion of the Nigerian Military to the rank of Captain. Abdullahi, according to the Nigerian Military has shown great professionalism in the discharge of his duties and a really likeable dedication in the cause of service delivery, despite being Non-Commissioned. Abdullahi’s leadership qualities has made him a liked figure to his Commanding Officer who considered it worthy to assign him a higher responsibility as the platoon commander of one of the leadership of the Battalion, a role he played excellently to the admiration of both his superiors and subordinates alike. The newly commissioned Garba Abdullahi has since been decorated with the badge of his new rank of Captain at the Battalion Headquarters located in Geidam, Yobe State by his Commanding Officer Lieutenant Colonel Owoicho Augustine Obochi, to the happiness of both officers and soldiers of the unit.